Knitted in a multiple of 3 stitches plus 2, this stitch is a one-row repeat and is a very fast knit. 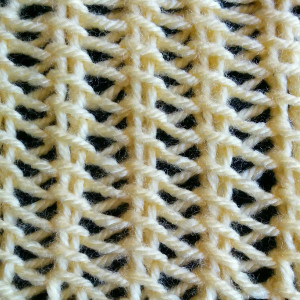 Even though the techniques used are not comparable to the original Bamboo stitch, the Bamboo Lace stitch poses a resemblance but with lace as an added flair. If you are interested in achieving a unique look for your knitting project, the Bamboo Lace stitch will surely not disappoint! Row 1: k1, *yo, sl1 wyib, k2tog tbl; rep from * to the last st, k1. Repeat Row 1 until desired length.